Alein#1, digital drawing, 20×30″ 8/5/017. 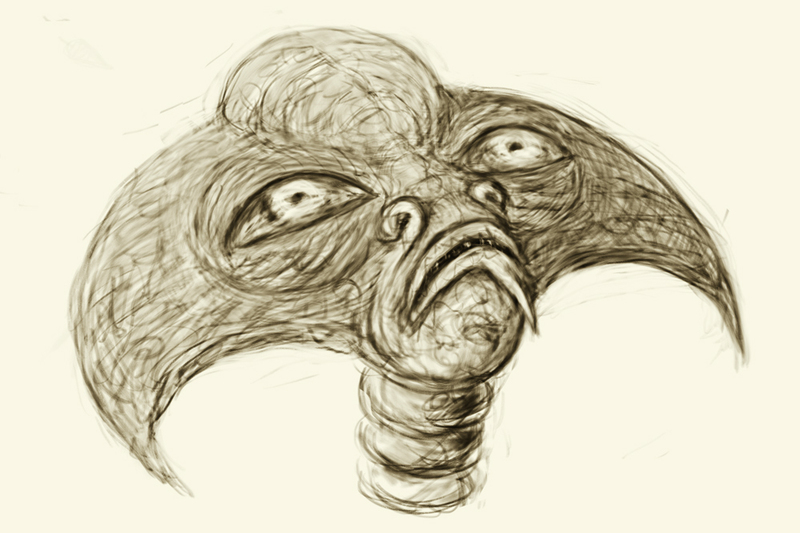 This is a sketch of an alien head for a new series I’m starting. I’m planning all aliens for the next few months. We’ll have to see if I stick with it. The series is unified around the topic, not the medium or style, so allows for stylistic variety. There’s a lot more to it than that, but with a first sketch, I’ll hold off on the specifics. I’m working on two more sketches at the same time that are very different. I’m trying to generate ideas (including coming up with aliens I haven’t seen before). I’m also working on a 3D model based on an alien I’ve already created. If you don’t like aliens, consider them as conscious beings and therefore surrogates for people, which is what they are. Posted in Alien MessiahTagged alien, art, contemporary art, digital art, drawing, Expressionism, sci-fi, SurrealismBookmark the permalink.